Godot’s audio processing code has been written with games in mind, with the aim of achieving an optimal balance between performance and sound quality. Godot’s audio engine allows any number of audio buses to be created and any number of effect processors can be added to each bus. Only the hardware of the device running your game will limit the number of buses and effects that can be used before performance starts to suffer. Godot’s sound interface is designed to meet the expectations of sound design professionals. To this end it primarily uses the decibel scale. For every 3dB, sound amplitude doubles or halves. 6dB represents a factor of 4, 9dB a factor of 8, 10dB a factor of 10, 20dB a factor of 100, etc. Since the scale is logarithmic, true zero (no audio) can’t be represented. 0dB is the maximum amplitude possible in a digital audio system. This limit is not the human limit, but a limit from the sound hardware. Audio with amplitudes that are too high to be represented properly below 0dB create a kind of distortion called clipping. To avoid clipping, your sound mix be arranged so that the output of the Master Bus (more on that later) never exceeds 0dB. This can take a bit getting used to, but it’s friendlier in the end and will allow you to communicate better with audio professionals. An Audio Bus (also called an Audio Channel) can be considered a place that audio is channeled through on the way to playback through a device’s speakers. Audio data can be modified and re-routed by an Audio Bus. An Audio Bus has a VU meter (the bars that light up when sound is played) which indicates the amplitude of the signal passing through. The leftmost bus is the Master Bus. 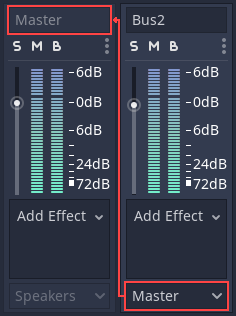 This bus outputs the mix to your speakers so, as mentioned in the item above (Decibel Scale), make sure that your mix level doesn’t reach 0dB in this bus. The rest of the audio buses can be flexibly routed. After modifying the sound, they send it to another bus to the left. The destination bus can be specified for each of the non-master audio buses. Routing always passes audio from buses on the right to buses further to the left. This avoids infinite routing loops. In the above image, the output of Bus 2 has been routed to the Master bus. 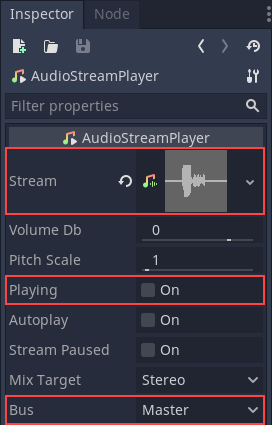 Finally, toggle the “playing” property to on and sound will flow. Amplify changes the amplitude of the signal. Some care needs to be taken. Setting the level too high can make the sound clip, which is usually undesirable. These are resonant filters which block frequencies around the Cutoff point. BandPass can be used to simulate sound passing through an old telephone line or megaphone. Modulating the BandPass frequency can simulate the sound of a wah-wah guitar pedal, think of the guitar in Jimi Hendrix’s Voodoo Child (Slight Return). The Chorus effect duplicates the incoming audio, delays the duplicate slightly and uses an LFO to continuously modulate the pitch of the duplicated signal before mixing the duplicatated signal(s) and the original together again. This creates a shimmering effect and adds stereo width to the sound. A dynamic range compressor automatically attenuates the level of the incoming signal when its amplitude exceeds a certain threshold. The level of attenuation applied is proportional to how far the incoming audio exceeds the threshold. The compressor’s Ratio parameter controls the degree of attenuation. One of the main uses of a compressor is to reduce the dynamic range of signals with very loud and quiet parts. Reducing the dynamic range of a signal can make it easier to mix. It can be used in the Master bus to compress the whole output. It can be Sidechained. This means it can reduce the sound level of one signal using the level of another audio bus for threshold detection. This technique is very common in video game mixing to ‘duck’ the level of music or sound effects when voices need to be heard. It can accentuate transients by using a slower attack. This can make sound effects more punchy. If your goal is to prevent a signal from exceeding a given amplitude altogether, rather that to reduce the dynamic range of the signal, a limiter is likely a better choice than a compressor. See below. Adds an “Echo” effect with a feedback loop. It can be used, together with Reverb, to simulate wide rooms, canyons, etc. where sound bounces are far apart. Distortion effects make the sound ‘dirty’. Godot offers several types of distortion: Overdrive, tan and bit crushing. Distortion can be used simulate sound coming through a low-quality speaker or device. Godot provides four equalizers with different numbers of bands. An equalizer on the master bus can be useful to cut frequencies that the device’s speakers can’t reproduce well (e.g. a mobile phone’s speakers won’t reproduce bass content well). 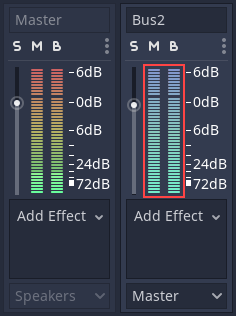 The equalizer effect can be disabled when headphones are plugged in. Filter is what all other effects processors inherit from and should not be used directly. These are filters that cut frequencies below a specific Cutoff frequency. HighPassFilter and HighShelfFilter are used to reduce the bass content of a signal. A limiter is similar to a compressor, but it’s less flexible and designed to prevent a signal’s amplitude exceeding a given dB threshold. Adding a limiter to the Master Bus is a safeguard against clipping. These are the most common filters, they cut frequencies above a specific Cutoff frequency and can also resonate (boost frequencies close to the Cutoff frequency). Low pass filters can be used to simulate ‘muffled’ sound. For instance underwater sound, sound blocked by walls, or distant sound. The opposite to the BandPassFilter, it removes a band of sound from the frequency spectrum at a given Cutoff frequency. The Panner allows the stereo balance of a signal to be adjusted between left and right channels (wear headphones to audition this effect). It probably does not make much sense to explain that this effect is formed by two signals being dephased and cancelling each other out. You can make a Darth Vader voice with it, or jet-like sounds. This effect allows the adjustment of the signal’s pitch independently of its speed. All frequencies can be increased/decreased with minimal effect on transients. PitchShift can be useful to create unusually high or deep voices. The Record effect allows audio passing through the bus to be written to a file. Reverb simulates rooms of different sizes. It has adjustable parameters that can be tweaked to obtain the sound of a specific room. Reverb is commonly outputted from Areas (see Audio streams tutorial, look for the “Reverb buses” section), or to apply chamber feel to all sounds. This effect has a few algorithms for enhancing a signal’s stereo spectrum. The default bus layout is automatically saved to the res://default_bus_layout.tres file. Custom bus arrangements can saved and loaded from disk.